A suitable beehive is fundamental for beekeeping. The area where the bees live is to be perfectly shaped to provide the right environment for beekeeping. For this reason, wooden hives thanks to the natural properties of wood offer the ideal production conditions in bees. The Bee my Box wooden beehive is Langstroth hive. 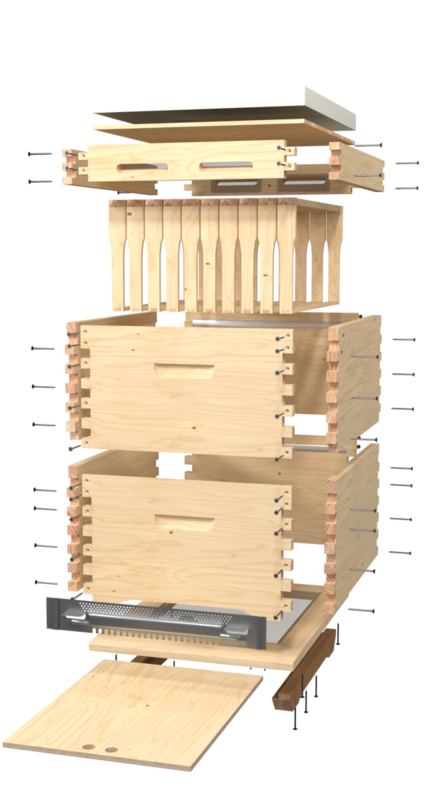 Langstroth beehive cells are considered to be easier to transport, as they consist of the base with their modifications according to the needs, two or more floors and a lid. All parts of the Bee my Box can be removed and replaced with new pieces. The external dimensions of the cell are 507.5mm depth (side view), 417.5mm wide (obverse view) and 245mm high. The screws are flat head 4.0 mm x 5.0 mm galvanized. With the Bee my Box wooden beehive you enjoy the most flexible & durable beehive on the market. It is well-designed to offer the ideal production conditions in the bees with a high aesthetic design. Capable of responding efficiently under the toughest conditions, always with the appropriate honeycomb finish. Its standard construction allows you to change any wooden part you want with a new one, without affecting the quality of the beehive. 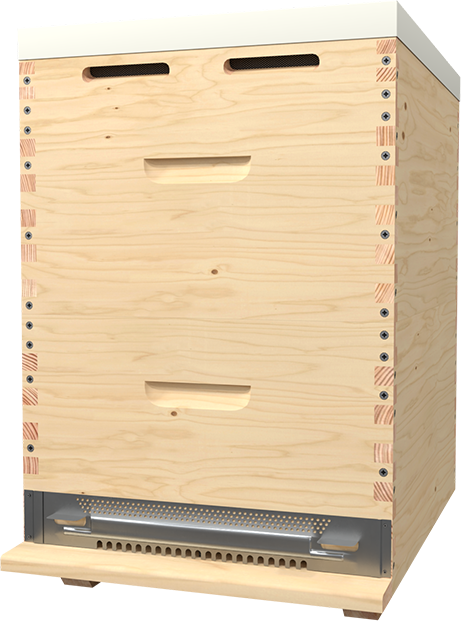 This fact, coupled with the excellent quality of Austrian dryer wood and the careful construction of Bee my Box in every detail and production stage of the beehive, ensures easy maintenance, the stable production quality of each beekeeper & economy in its budget. Bee My Box wooden beehive is the ultimate innovator in beekeeping tools. The robust construction & perfect application that characterizes the Bee My Box bee cell is due to the ideal combination of experience with our craftsmanship and the latest technology we use for wood processing. Spruce Austrian wood of artificial drying is used for the construction of the wooden blister. Spruce due to the resin contained in the wood body is a top material for the manufacture of a wooden beehive since it gives better qualities than the fir tree commonly used in wooden bee boxes. The legs of the wooden beehive are made of oak trees that contribute to the greater resistance of the honey to moisture. Oakwood is mainly used in the manufacture of outdoor wood because of its high density it is the best solution for the site that has direct contact with the ground. Powerful screw connectors have been fitted to the surface connection. Wooden type screws are provided, which offer extremely durable hold on the wooden beehive, combined with the pre-drilling of the point where it will be screwed. Bee My Box is the natural evolution of the family business Laitsos Machinery, which since 1979 has been active in the sales of woodworking machinery & wood.